Clearance requirements as outlined in the Building Code, CSA-B365 and certified factory built appliances tested under the appropriate standard are based on surface temperatures that approach 90 degrees Celsius. ​Spontaneous combustion occurs when something ignites without being exposed to a direct flame. If wood is heated rapidly for a short time, it may not combust until perhaps 480°C (920°F). But if a surface is heated steadily for a extended duration, it can ignite at low temperatures. This process of ignition is termed Pyrolysis. b) 12 mm for exterior chimneys. The fireplace facing clearance requirements vary depending on how much it projects above the brick face. 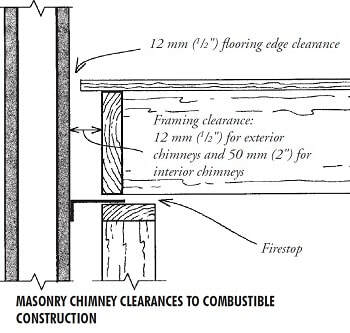 6" is of clearance from combustibles is required on either side of the opening and above, but 12" is required above the opening if the the facing projects more than 1 1/2". 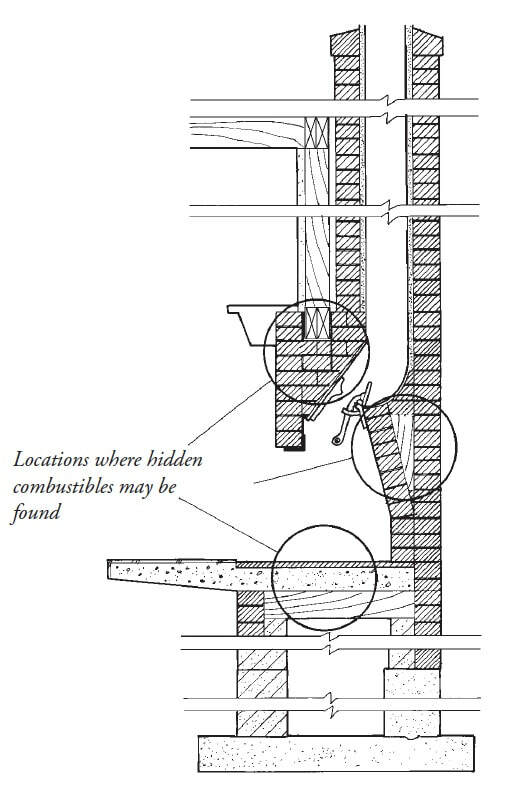 1) Combustible material shall not be placed on or near the face of a fireplace within 150 mm of the fireplace opening, except that where the combustible material projects more than 38 mm out from the face of the fireplace above the opening, such material shall be not less than 300 mm above the top of the opening. 1) Not less than a 100 mm clearance shall be provided between the back and sides of a fireplace and combustible framing, except that a 50 mm clearance is permitted where the fireplace is located in an exterior wall. 2) Not less than a 50 mm clearance shall be provided between the back and sides of the smoke chamber of a fireplace and combustible framing, except that a 25 mm clearance is permitted where the fireplace is located in an exterior wall. 1) Metal exposed to the interior of a fireplace such as the damper control mechanism shall have not less than a 50 mm clearance from any combustible material on the face of the fireplace where such metal penetrates through the face of the fireplace. b) 150 mm where the projection is less than 38 mm. • Behind the smoke shelf, where framing lumber is sometimes used instead of brick rubble to fill the space. In some cases, these combustibles are not noticed, or cause problems in fireplaces that are used only rarely. However, they may become hazardous if the fireplace is retrofitted with glass doors or a fireplace insert and is used more often or continuously. There is no way to calculate when a house fire will result from non compliant clearance requirements, but to avoid any issues, the codes must be respected.